Last fall, I was able to spend a couple of days in Amsterdam, Netherlands. I spent the first of my two days exploring the city with friends from the eastern part of the country. The second day I visited as many yarn and fabric shops as I could squeeze into the day. My friend, Greet, and her husband, raise sheep on their farm in Eibergen, Netherlands. Although their breed of sheep is mostly used for meat, Greet has been experimenting with spinning the fleece and dyeing the yarn. Her latest projects involve using Koolaid to dye the yarn. She was having a hard time finding the drink mix in the Netherlands, so she asked me to help her out. I brought her about 200 packages of Koolaid and traded for several skeins of her yarn – what a great deal! My friends and I spent an enjoyable day in the city. It was wonderful to see Greet, her son, daughter-in-law, and the grandson I had not yet met. After dinner, they took the train back home, while I went back to the hotel to double check my shopping route for the next day. The first shop I found was the Stephen and Penelope Yarn Shop. It was quite a walk from the nearest tram stop but worth the distance. The street was a very pleasant one – like many others in Amsterdam. The shop was deep and narrow. Its front was well lit by a large window, but the back of the shop also had good lighting. The front of the store was filled with books and projects by Stephen West – one of the store owners. I loved seeing in person the shawls I had only seen in pictures. There was a nice selection of yarn – Cascade, Malabrigo, Madelinetosh, and Hedgehog are some that stood out to me. I purchased some HHF sock yarn – specially dyed for Stephen and Penelope. The staff person working the day I was there was especially friendly and helpful. As I walked out of the yarn shop, I noticed a fabric shop next door. 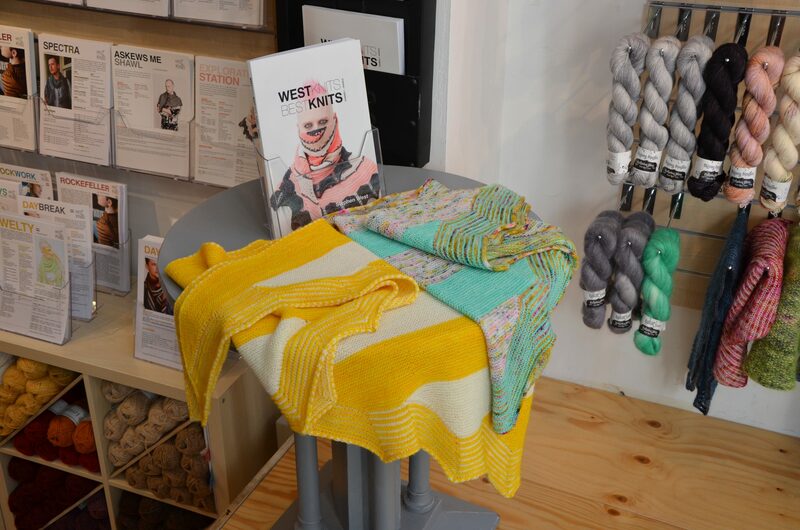 A. Boeken is a store that carries fabric and accessories. The accessories section in this small store was larger and much more interesting than what we usually see in the United States. I shopped around for a little while, but I was not looking for dress fabric, which was their specialty. I was tempted by all the accessories, but didn’t buy anything. I wandered around the city a bit more, enjoying the beautiful day. 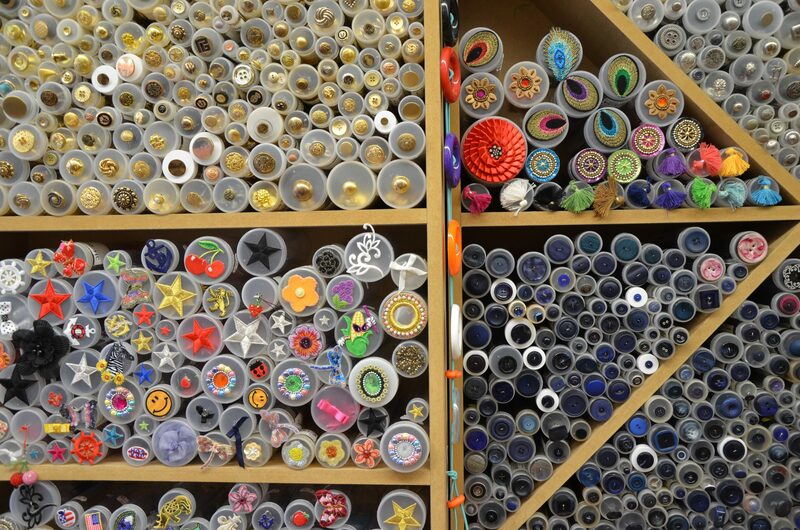 Then, I made my way over to the first quilt shop – Birdblocks. I had seen the shop in 2009, but it was closed by the time we got there, so I was anxious to see it this time. 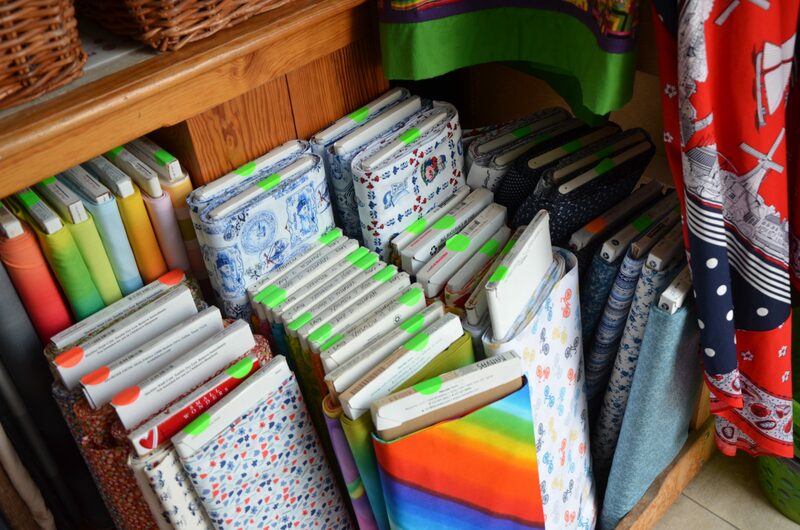 Near the front of the store, there was a large selection of what I would call typical Dutch fabric, in addition to a rainbow wall of other cotton quilt fabric. I found a pattern for a quilt that featured classic Dutch houses and buildings. I bought a little blue fabric as a start for the quilt. The person minding the store was a friend of the owner (who had been ill for awhile). She was pleasant and knowledgeable. 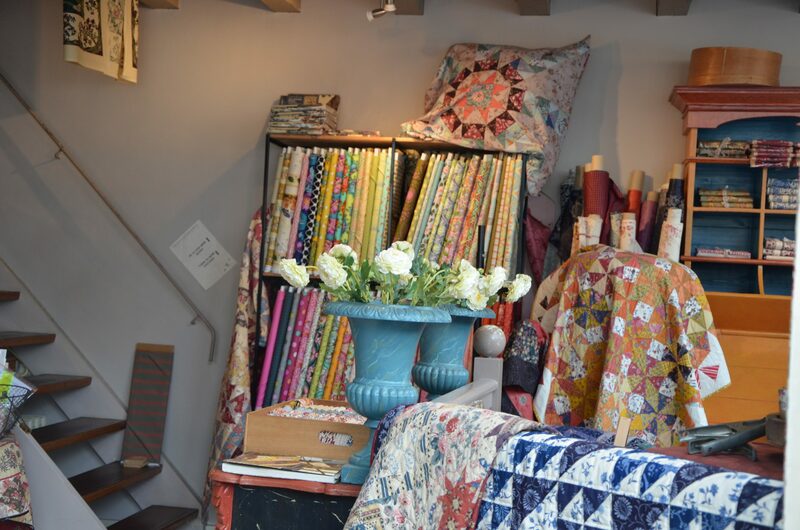 Just a few doors down was De Haan & Wagenmakers, a quilt shop that sold “Original Dutch Fabric.” The shop and the fabric were beautiful, but the staff was a bit preoccupied and paid little attention to me. I did pick up a little more fabric for the quilt pattern I had purchased. It was almost lunch time, but I wanted to find de Afstap before I ate. 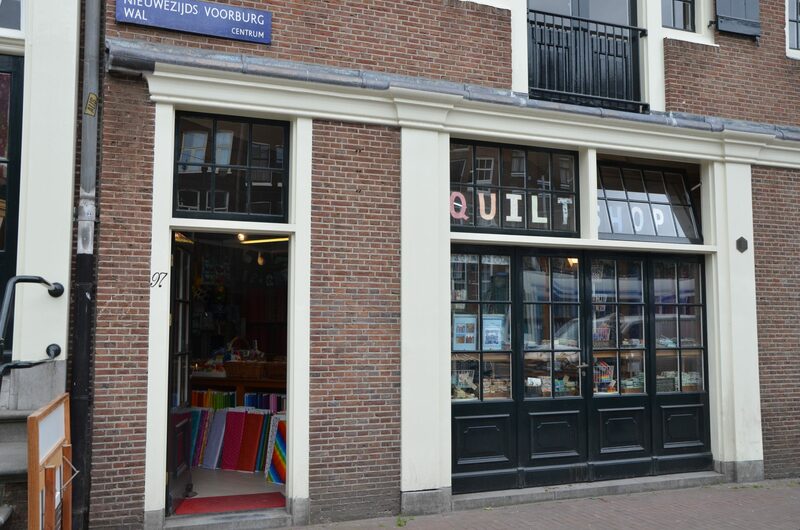 This beautiful yarn shop is located on a small street between the Singel and Herrengract canals – it is in a very picturesque area. I found the shop, but decided to eat lunch before I shopped and chose a cafe located on the Singel canal. The yarn shop carries Rowan, Noro, Regia, and several other yarns; needles by Addi and ChaiGoo; and lots of books and magazines. One could spend days looking through their library. I found some beautiful Rowan silk yarn to add to my stash. My final stop was at Weldraad, another yarn shop. 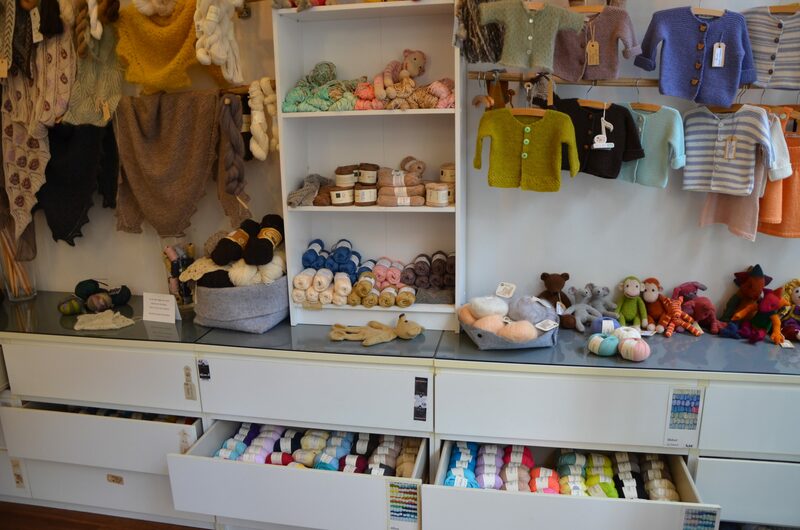 I was a little intimidated when I entered the shop because all of the yarn is in drawers. It felt odd going through the drawers looking for yarn. The friendly store owner put me at ease, though, and I shopped like the others who were in the store. The store carries Adriafil, Opal, Fonty, and other yarns. There are several projects on display for ideas. All the shops that I visited were part of Amsterdam Central. There are other shops that are located further out. I did not have time to venture away from the center this time, but I hope to the next time I am in the Netherlands. I had fun and was productive during my short stay in Amsterdam. Maybe next time I will be able to stay longer. Have you visited any of these shops? 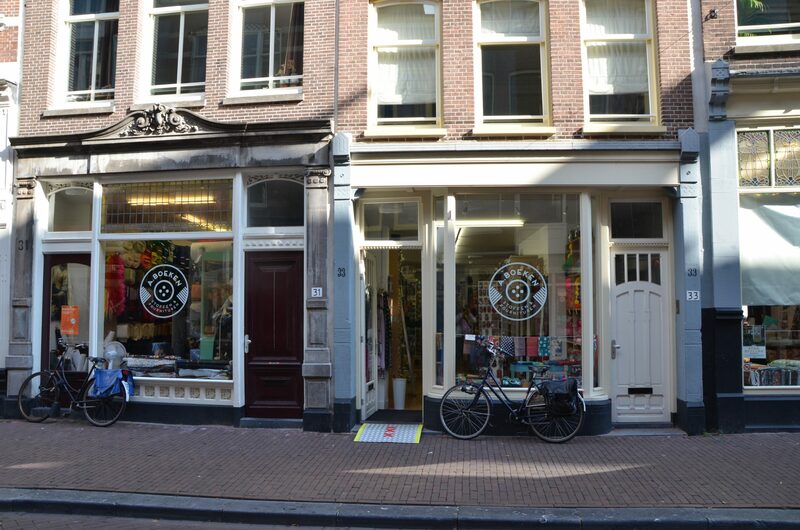 Have you been to other shops in the Netherlands? Leave a comment below. Hi!! I just found this post. 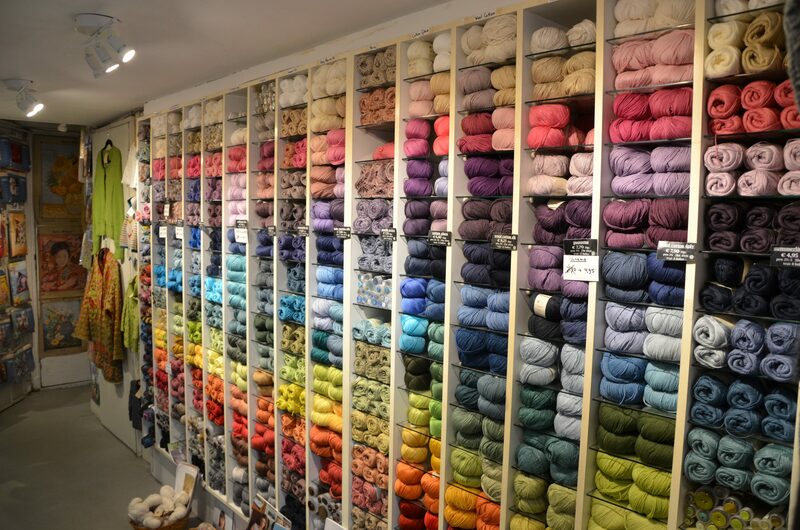 I’m headed to Amsterdam at the end of March, and I’m scoping out the yarn stores, trying to plan my stay there. I’ve been sort of searching the internet for some names of dutch yarn brands/dyers/vendors but I’m having trouble. I like to buy at least one skein from a “local” source when I’m in a new place. Any thoughts? My recommendation would be to stop in at Stephen & Penelope (designer Stephen West). 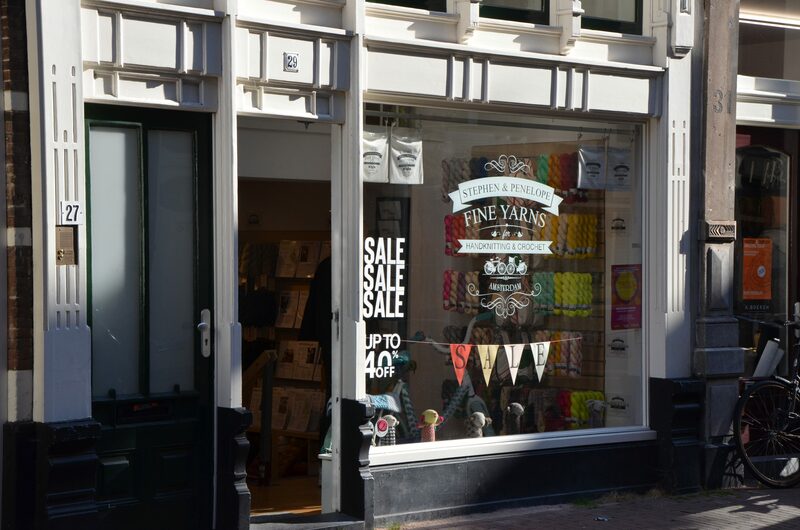 They carry two Dutch yarns that I am familiar with – they might have more that I don’t know about. When I was last in Amsterdam, I picked up a skein of Squirm Sock by Undercover Otter, a dyer from Amsterdam. Then, this past January, Stephen & Penelope had a booth at Vogue Knitting LIVE New York, where I bought several skeins of Undercover Otter’s Singularity. The colors are luscious. At a different booth in New York, I was able to purchase a Merino Single by Uschitita, another Dutch dyer. Stephen and Penelope carries Uschitita yarn, although it looks like it is also available at a couple places in the US and Canada. I shopped at the other stores as listed in my post – and they had beautiful yarn, but I don’t specifically remember any Dutch yarn at those stores. Hope this helps.